Delving deep into the history of our cosmos, the Herschel Space Observatory scrutinised hundreds of thousands of star-forming galaxies, peering back in time to when the Universe was less than one billion years old. These observations probed the peak epoch of stellar production, about ten billion years ago, when galaxies were forming stars roughly ten times faster than their present counterparts. Surveying the sky for almost four years to observe the glow of cold cosmic dust embedded in interstellar clouds of gas, the Herschel Space Observatory has provided astronomers with an unprecedented glimpse into the stellar cradles of our Galaxy. As a result, giant strides have been taken in our understanding of the physical processes that lead to the birth of stars and their planetary systems. For years, astronomers have puzzled over a massive star lodged deep in the Milky Way that shows conflicting signs of being extremely old and extremely young. Researchers initially classified the star as elderly, perhaps a red supergiant. But a new study by a NASA-led team of researchers suggests that the object, labeled IRAS 19312+1950, might be something quite different -- a protostar, a star still in the making. Our Sun missed the stellar "baby boom" that erupted in our young Milky Way galaxy 10 billion years ago. During that time the Milky Way was churning out stars 30 times faster than it does today. Our galaxy was ablaze with a firestorm of star birth as its rich reservoir of hydrogen gas compressed under gravity, creating myriad stars. But our Sun was not one of them. It was a late "boomer," arising 5 billion years later, when star birth had plunged to a trickle. Astronomers mine data from the Planck and Herschel missions to find a treasure chest of galaxy clusters. By combining observations from the Japan-led Suzaku X-ray satellite and the European Space Agency's infrared Herschel Space Observatory, scientists have connected a fierce "wind" produced near a galaxy's monster black hole to an outward torrent of cold gas a thousand light-years across. One galaxy devoured remnants of another galaxy, quenching the formation of new stars. Astronomers have for the first time caught a glimpse of the earliest stages of massive galaxy construction. The building site, dubbed "Sparky," is a dense galactic core blazing with the light of millions of newborn stars that are forming at a ferocious rate. Astronomers using ESA’s Herschel space observatory to probe the turbulent beginnings of a Sun-like star have found evidence of mighty stellar winds that could solve a puzzling meteorite mystery in our own back yard. Astronomers have discovered that a molecule vital for creating water exists in the burning embers of dying Sun-like stars. When low- to middleweight stars like our Sun approach the end of their lives, they eventually become dense, white dwarf stars. In doing so, they cast off their outer layers of dust and gas into space, creating a kaleidoscope of intricate patterns known as planetary nebulas. The Herschel Space Observatory has uncovered a weird ring of dusty material while obtaining one of the sharpest scans to date of a huge cloud of gas and dust, called NGC 7538. The observations have revealed numerous clumps of material, a baker's dozen of which may evolve into the most powerful kinds of stars in the universe. A cosmic mystery regarding oxygen has deepened, thanks to new findings from the Herschel Space Observatory, a European Space Agency mission with important NASA contributions. Observations of a newly forming star have revealed strangely low levels of molecular oxygen, the kind we breathe, in the emerging star's gassy, dusty environment. Scientists have discovered a young galaxy acting in unexpectedly mature ways. The largest census of dust in local galaxies has been completed using data from the Herschel space observatory, providing a huge legacy to the scientific community. Herschel has discovered massive elliptical galaxies in the nearby Universe containing plenty of cold gas, even though the galaxies fail to produce new stars. Astronomers using NASA's Hubble and Spitzer Space Telescopes, Europe's Herschel Space Observatory, and many ground-based telescopes have pieced together the evolutionary sequence of compact elliptical galaxies that erupted and burned out early in the history of the universe. How and when galactic metropolises cease their opulent ways is the subject of new research from NASA's Spitzer Space Telescope. A 'loner' gas called Argon has paired up to make molecules in the tattered remains of an exploded star. A twisted pattern of ancient light called B-modes has at last been detected with help from the Herschel space observatory. Although it might seem counterintuitive, if you get far enough away from a smoldering young star, you can actually find snow lines—frosty regions where gases are able to freeze and coat dust grains. Astronomers believe that these snow lines are critical to the process of planet formation. The team behind Herschel's SPIRE instrument has been awarded the 2013 Sir Arthur Clarke Award for academic study and research. The award is in recognition of the scientific achievements of the SPIRE instrument, which was designed, built and operated by an international team of astronomers, scientists and engineers. The stuff of stars is not always easy to see. Thanks to the Herschel Space Observatory, invisible pools of gas in our galaxy are being mapped better than before. A massive and rare merging of two galaxies has been spotted in images taken by the Herschel space observatory, a European Space Agency mission with important NASA participation. The supermassive black hole at the core of our Milky Way galaxy is gobbling up hot gas, according to a new study from the Herschel space observatory. Astronomers trace water in Jupiter's intermediate atmospheric layer back to the famous Shoemaker-Levy 9 comet impact of 19 years ago. Busy-bee galaxy seen churning out stars when our universe was just a baby. In a new view of a vast star-forming cloud called W3, the Herschel space observatory tells the story of how massive stars are born. The 15 newly observed protostars turned up by surprise in a survey of the biggest site of star formation near our solar system, located in the constellation Orion. The Herschel space observatory is expected to exhaust its supply of liquid helium coolant in the coming weeks, after spending more than three years studying the cool universe and surpassing the expectations of the international team of scientists involved. The Herschel Space Observatory has detected a cool layer in the atmosphere of Alpha Centauri A, the first time this has been seen in a star beyond our own Sun. The finding is not only important for understanding the Sun's activity, but could also help in the quest to discover proto-planetary systems around other stars. The possible effects of supermassive black holes on star formation in their host galaxies pose a tricky puzzle. Galaxy surveys from Herschel are being used to try to understand this complex interaction. A star thought to have passed the age at which it can form planets may, in fact, be creating new worlds. The disk of material surrounding the surprising star called TW Hydrae may be massive enough to make even more planets than we have in our own solar system. Two new eye-catching views from the Herschel space observatory are fit for a princess. They show the elegant spiral galaxy Andromeda, named after the mythical Greek princess known for her beauty. Orion, the famous hunter presiding over northern winter skies, may experience a stellar crash in its future. The red star at its shoulder, called Betelgeuse, appears to be set to collide with a dusty "wall" in 5,000 years. Scientists using the Herschel Space Observatory made new observations of asteroid Apophis as it approached Earth this past weekend. The data show the asteroid to be bigger than first estimated, and less reflective. Astronomers have discovered what appears to be a large asteroid belt around the star Vega, the second brightest star in northern night skies. 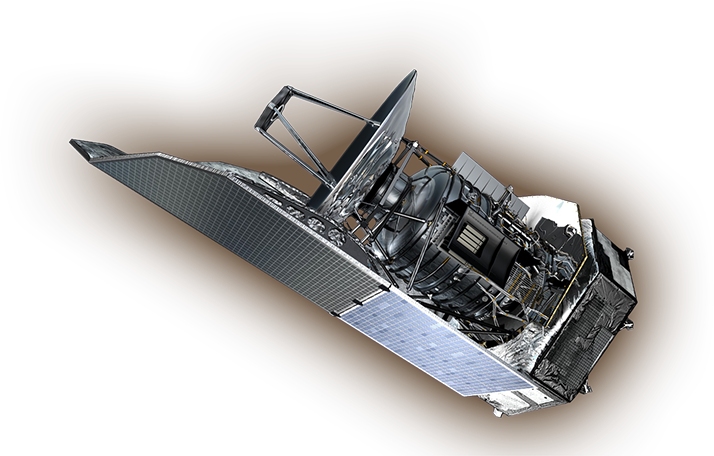 The scientists used data from NASA's Spitzer Space Telescope and the European Space Agency's Herschel Space Observatory, in which NASA plays an important role. A new galactic game launches today that lets citizen scientists identify the glowing clouds where future stars will be born. The online experience, called Clouds, is a new addition to the Milky Way Project, where everyone can help astronomers to sort and measure our galaxy.